Switzerland's decision to remove its currency peg on the franc is expected to wreak havoc on certain industries -- and unlucky individuals. The value of the franc has soared since the announcement, up by about 22% versus the euro and nearly 20% versus the U.S. dollar. 1. Swiss watchmakers (and collectors): Watchmakers including Rolex, TAG Heuer, Richemont and Swatch (SWGAY) will see costs skyrocket in Switzerland, where they do most -- if not all -- of their design and manufacturing work. But Swiss bank UBS (UBS) notes that watchmakers should ultimately be able to pass those higher costs on to their customers. The Swatch Group's CEO, Nick Hayek, was less optimistic. He said the central bank decision on the franc is akin to a "tsunami" that will hit exporters and the entire nation. 2. The Swiss economy: Switzerland's economic growth projections are being slashed as economists worry that a higher franc will hit exporters and usher in deflation. UBS predicts the Swiss economy will expand by just 0.5% in 2015, down from an earlier projection of 1.8%. Expectations for 2016 have also been lowered, down to 1.1% from 1.7%. 3. Chocolate companies (and chocolate lovers): Shares in Lindt & Sprungli tumbled by as much as 8% on the Swiss stock exchange. Kathleen Brooks, a research director at Forex.com, jokingly recommends stockpiling Lindt chocolate balls. 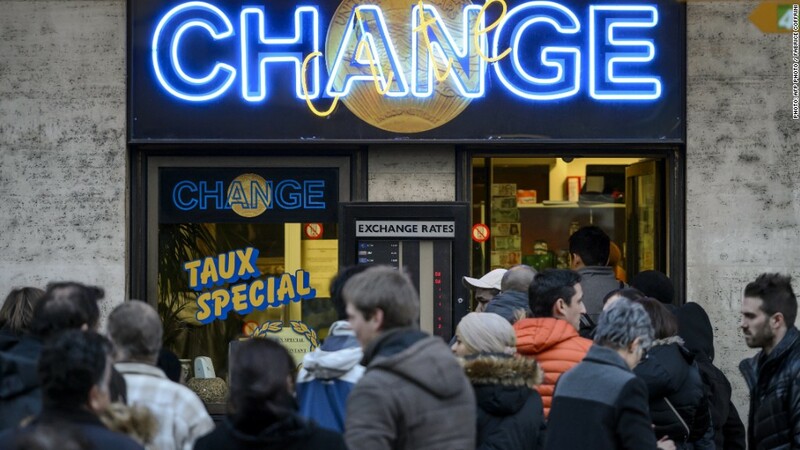 "A stronger franc could force the retailer to put up its ... prices to protect its profits." But Lindt told CNNMoney that is has eight production facilities outside Switzerland, which will "somewhat compensate [for] the disadvantages of the strong Swiss franc." Lovers of artisanal Swiss cheese may also want to stock up. 4. Roger Federer: The Swiss tennis star, who is an official spokesperson for a variety of Swiss companies, including Lindt and Rolex, may find that his earnings get squeezed. Winning tennis prizes in other countries won't be nearly as lucrative when he exchanges the money for francs. 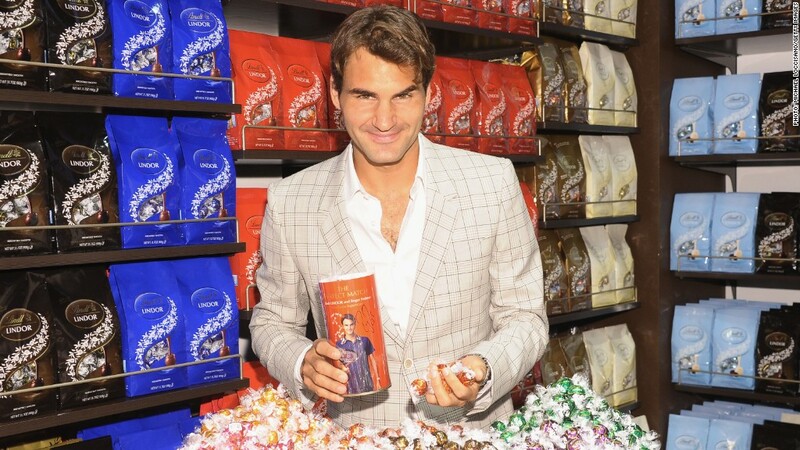 Tennis star Roger Federer and chocolate company Lindt are expected to suffer from a higher franc. 5. Tourists: If you had grand plans to go skiing in Switzerland this year, be prepared to pay more. The tourism industry across Switzerland is expected to suffer as prospective visitors opt for other destinations. 6. Polish mortgage holders: Poles have taken out about 30 billion euros ($35 billion) worth of franc-denominated mortgages, according to the Financial Times. If the franc continues to trade around its current level, average mortgage repayment costs could surge by about 17%. This raises concerns about a jump in mortgage defaults. 7. Currency traders: Currency brokers are bleeding after clients endured heavy losses from the unexpected market gyrations. Interactive Brokers Group (IBKR) said its customers lost around $120 million due to the sudden move in the franc. Shares in the company sank Friday. Meanwhile, FXCM (FXCM), a leading global currency broker, said it may not have enough capital to continue trading after its clients suffered significant losses.